The Marvel Cinematic Universe is a continually expanding entity. In addition to 13 films, there are also a handful of television series, the majority of which are being produced on Netflix. While the streaming service has been gearing up for an additional four series, a new rumor is claiming that they’re planning on expanding the Netflix universe even further. Namely, with an outstanding 3 new shows. This rumor comes to us from MovieCreedLive, who claim that they have sources close to the Marvel/Netflix team. Apparently the plan is to bring three more Marvel heroes to the small screen: Blade, Ghost Rider, and Moon Knight. If these rumors are to be believed, then a total of eight solo series will be produced, in addition to the Defenders miniseries. All things considered, the report of not one, but three separate new series being produced seems rather unlikely. And there are big factors which this report has working against it. Netflix and Marvel’s partnership has been heavily planned and expanded upon. The streaming service has already released two seasons of Daredevil, as well as the first of Jessica Jones. Currently in production are Luke Cage and Iron Fist, which will round out the full cast of The Defenders. Additionally, Jessica Jones will have a sophomore season, and Netflix has recently announced the Daredevil spin-off series The Punisher. With all of these shows being made, it would be around the year 2020 before production would be able to start for any of the rumored new shows. And I would presume that Marvel would want to assess how successful the myriad other series became before planning a trio of new ones. Additionally, all of the previously planned series interact with each other in New York City. Characters from each show crossover, and Rosario Dawson’s Claire Temple is set to appear in every series. Adding three more players into the mix might make New York a bit crowded, in regards to vigilantes. Unless the rumored trio of new shows use a different setting altogether. 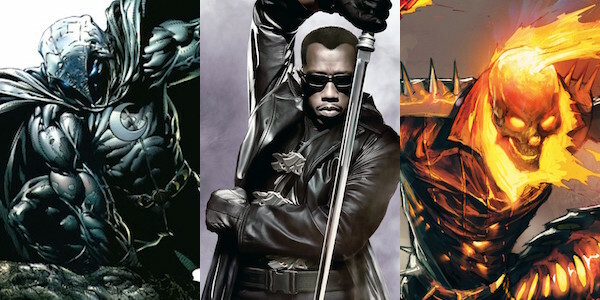 Ghost Rider and Blade also revolve around more supernatural aspects of the Marvel Universe. Ghost Rider sells his soul and finds his body consumed by hellfire, while Blade battles vampires. This is a stark departure from the gritty and realistic tone of the Marvel world thus far. Moon Knight, which is essentially Marvel’s answer to Batman, could fit into the previously established world of New York, but, once again, this development seems like a conversation that needs to happen many years down the road. What do you think of these rumors? Would you enjoy seeing any of the three rumored series come to fruition? Or does Marvel and Netflix already have their hands full with the previously announced six series? Sound off in the comments section below.